V700 is the premium quality analog audio module system by adt-audio, based on the tradition of German audio technology. This audio module system offers headroom of +30 dBu into 300 Ohms load, more than 120 dB dynamic range, internal balanced design and torodial transformers of the best available quality. This features make V700 the best choice for any application that requires the highest sonic quality. V700 offers a wide range of modules for Stereo Mastering, M/S Stereo, and Stem Mixing. The variety of available devices for the V700 audio module system covers all aspects of analog audio processing and control - from a stand alone preamplifier or from your special combination of mastering modules up to a custom build console. The range of MASTERING MODULES covers not only common devices like EQ's and Compressors but also many very special units. M/S Stereo Direction Controller with /MS Equalisation, Niveau Filters, Elliptical Equalizers, Phase Linear Filters, dynamic EQ's, and Harmonics Generators are only a few examples. Very high performance Microphone Amplifiers, Multiband Vienna Bridge based fully parametric EQ's with a gain range of 24 dB and dynamics processors with sophisticated control features can be used to combine analog frontend systems with unforeseen capabilities.Detailed descriptions of all the modules and some examples of front-ends and mastering set can be found on the following pages. The modules of the V700 audio module series are hand-crafted using only the absolute best components and materials available. All V700 audio modules feature balanced and floating inputs and outputs using Haufe or Lundahl made transformers. These units are able to achieve signal levels as high as +30dbu at 40 Hz. Almost all circuits in these audio modules are internally balance. This means that a mono equalizer is actually built with a stereo circuit that is symmetrically combined. This certainly increases the cost and time to produce the units; however, it offers some serious technical advantages. It affords a doubling of the internal headroom. The V700 units can operate at levels > 30dBu; this headroom is available within the entire circuit, not just at the input and output. All internal amplifier stages can operate at this level. These modules have a continuously higher dynamic range compared to similar processing equipment with non-symmetric circuitry. The dynamic range of almost all processing devices is more than 120 dB. 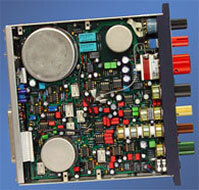 There are two standard types of mounting-frames available for the V700 audio module system. The RACK version is 5U high and fits into a standard 19-inch rack. It will accept 9 processing modules. The CUBE frames are 5U high tabletop versions that accept from 2 to 6 processing modules (depending on version) and have an external power supply. CUBE-2, CUBE-4 and CUBE-6 differ only in size and the number of available slots. All frames will accommodate either a mono or stereo module in all slots and are wired for both. The XLR input and output connectors for individual modules are located on the back of the frame. Furthermore, custom frames are available. Several Power Supply Sections are available. The IN1 power supply devices has a sufficient capacity for the CUBE frames. 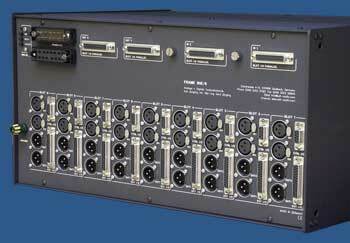 A RACK with a complete set of modules installed requires an IN3 power supply unit. Devices to supply several frames are also available. Because of the large demand for custom built consoles and analog audio processing systems and configurations that we have received over the last few years, we have reintroduced the module system. Based on some of our older units and on new designs, we presently have a range of more than 70 different module units. Naturally, all V700 system devices benefit from the latest in modern technology including fabrication techniques and modern, high performance components, mean-while, all the old principles of quality analog audio design and construction remain. A new housing system, and standardized mounting racks now make it possible to use the modules as stand-alone units or in fully integrated systems. Of course we continue to build complete custom recording, mixing and mastering systems based on the modular console concept.